Chestermere’s Tarun Fizer is enjoying his rookie year with the Victoria Royals. Photo by Jon Howe. Tarun Fizer thought he had the life-time souvenir, right when it would have made the perfect Christmas gift. Alas, the replay officials at the WHL played Grinch instead, calling back what would have been the Chestermere native’s first goal in major junior. “I thought I scored but on the replay the puck never crossed the line so they called it back,” said the 16-year-old forward. “The monkey on my shoulder was even bigger than it was before. 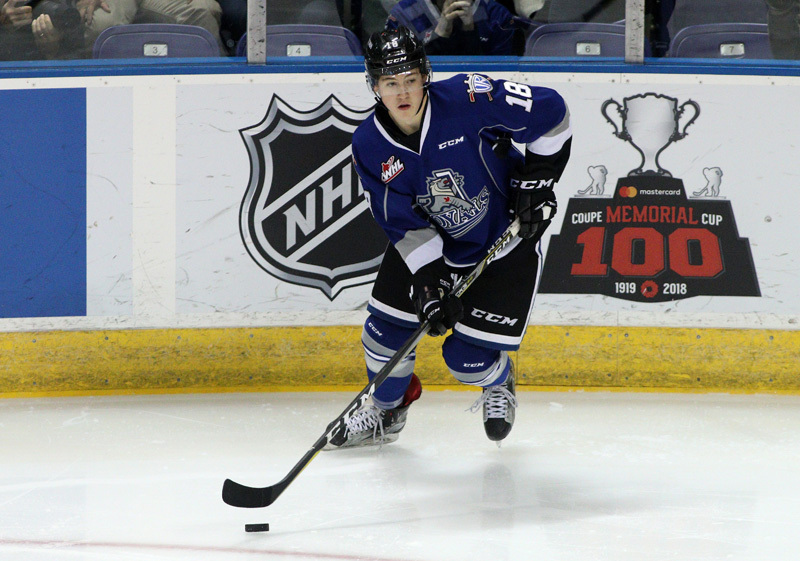 Fizer, who also scored March 11 against the Cougars, is hoping he can carry that momentum into the WHL playoffs, as the Royals take on the rival Vancouver Giants in the opening round. 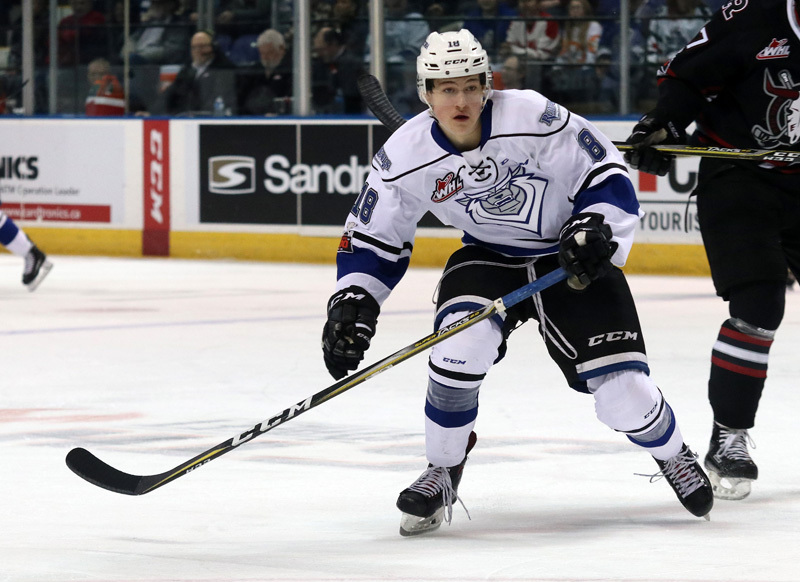 The rookie season has been a rollercoaster for Fizer, who grew up playing with the Rocky Mountain Raiders and Strathmore’s UFA Bisons while being drafted fourth round by the Royals. Early in the year, he suffered a head injury and that kept him out a full month, leaving him to watch and learn instead of being in the action. When he did return to the lineup, he was down the depth chart, as is the case with most young players entering the top level of players under the age of 20. What makes the adjustment even harder is that for the majority of the time Fizer played hockey growing up, he was one of the top players on his team, and he garnered ice time because of that. There are a lot of difference this year though. He’s living far away from home, in a much better climate (“The lowest it’s been here is minus-2, which is awesome,” he said with a laugh), and there is a lot of travel involved for the team isolated on Vancouver Island. In between hockey practices, travelling and games all over Western Canada, Fizer also has to complete his Grade 11 work, but there is time to do it on buses, and — unique to the Royals — ferries. “There’s a lot of challenges in travelling and keeping up with school,” Fizer said. “I’m 16 so I’m still going to school. The Royals didn’t have a game scheduled in Calgary this year, but his family was able to follow him on a trip through Edmonton, Medicine Hat and Lethbridge. A year ago, he was working through a collarbone injury when the Royals came to town, so he didn’t get to join them for a day at the Saddledome, so he’s looking forward to next season when Victoria visits his hometown. It’s always a bonus when he has family in the stands watching, which was the case over the Family Day weekend in February. He’s hoping to show off that improvement in the playoffs. By finishing out the season in second place in the B.C. Division, the Royals are the favourites in the opening round against the Giants. Fizer is hoping a good opening round can lead to a long playoff run, and it helps they won the season series against Vancouver 6-3. “I wouldn’t say it’s a huge rivalry but it’s one of the bigger ones,” he said. “You always want to beat the guys next door.